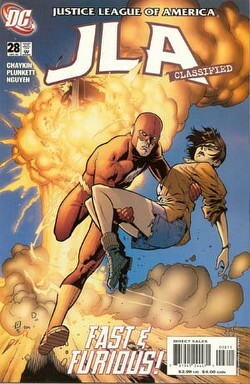 Tensions between Santa Bertriza and Del Canto reach a boiling point after Faith and the Flash accidentally set off a conflict between the metahuman forces of both countries. The President is concerned, but Aquaman manages to convince him to trust the League much to the shock of J'onn J'onzz given Arthur's feelings on the subject. The members of the League who are undercover get the common man's reaction to the conflict while discussing the impact of Faith and Flash's mistake. They finally meet and decide to get a little more involved, though still in disguise. After taking down a good number of the metahuman operatives the League meets again only to find Kyle and Diana missing. Story - 4: This issue is usually the point where the stories that run in this series begin to slow down or where the writer starts padding things to get that all important six issue story arc to allow for the inevitable trade paperback release. For the first time in a long time I didn't get that feeling from this issue. Of course as solid as the first two issues were I would have been surprised if this installment went any other way. "Secret History, Sacred Trust" has been from the beginning a shining example of how you can tell a story with the League where they get involved in international diplomacy and have it not only work but also be an entertaining read that gets into the heads of the characters involved. While Chapter Three did start off feeling a bit slow and almost repetitive it allowed Chaykin the room to play with the characters in their undercover guises while having them discuss Faith and Flash's mishap. This was a lot of fun, especially watching Diana play the spoiled American. Given how Diana has been portrayed over the last few years this was an amusing departure and kind of expanded her range as a character. I can almost see this as Diana cutting loose and poking fun at the decadent American culture she has made herself a part of over the past ten or so years. Wally got some unwanted attention this time out as well and while I don't entirely agree with Chaykin's take on him I can't see too many faults with it either. On the surface it looks like Wally is being portrayed as naïve, but I see it more as Wally having a deep and rooted sense of honor and duty that comes from being raised in the Mid-West. I always kind of saw Barry in the same light and since Barry was more of a father to Wally than his actual father this makes sense. Wally didn't want to stand by and watch the locals getting tortured and killed but he knew that he and Faith had to maintain their cover. Wally's also the only one who ran around in his own costume while using his abilities, which, Justice League Elite notwithstanding, shows that even while undercover he's still the Flash. The fact that he got to make up for inadvertently escalating the conflict last month was a nice touch and brought his little sub-plot full circle, at least as far as this issue is concerned. The small bit with Rozamunde Van Derkli was a neat throwaway scene. I love teases like this, especially when they are this brief and thrown in the way Chaykin paced it. Kyle is talking to his publisher, then Van Derkli is having her tense little conversation and it goes right back to the League with Clark's interview. The scene had a nice, organic feel to it, which I not only enjoyed but appreciated as a reader. My favorite line from the entire issue though was, "Typically Clark Kent, A.K.A. Superman, overachieves..." Again, Chaykin seems to understand the characters he's writing and like Superman's actions and dialogue from the first chapter Chaykin captures him perfectly in a sentence or two. (He does the same thing with Bruce and manages to make the obnoxious, "I know better than you" Bruce to come off as a man trying to get the best out of his teammates instead of him being, you know, a jerk.) Superman tries too hard. It is one of his faults, if you can really call it that and we got to see this not only while he was undercover in the black, "After Eight" outfit but also as Clark when he uses his heat vision to stop the guy from stealing the camera earlier in the story. But do you know what my personal highlight from this issue is? The fact that when Superman goes undercover in the "After Eight" outfit he slips on a pair of glasses. Well, you can take the man out of the secret identity, but you can't take the secret identity out of the man. Art - 4: Despite the fact that the art is getting "uglier" (and I use the quotes because the art really isn't ugly, just not as sleek as I usually like) I continue to enjoy what Plunkett and Nguyen are doing with this story. The story telling is so strong and clear that you almost forget the rough quality that the combination of the two artists' styles produces. Of course the art fits the story perfectly so I really couldn't see the story being produced in any other way. Plunkett and Nguyen make me feel whatever the scene requires, whether it is the tension between Aquaman and J'onn or the heat and distressing nature of Del Canto and Santa Bertiza. The characterization isn't in the dialogue most of the time, but in the expression the characters have on their faces. While it is true that most of the men have receding hairlines (especially Bruce) everyone has their own distinct look and feel. The action sequences were particularly well done. Much of the last issue was taken up with the League undercover so this was a good time to have them cut loose. The full page spread with Superman in the middle, Bruce at the bottom and J'onn in both corners was especially strong, but only because the pages that preceded and followed it broke up the action to allow each Leaguer to have their own little moment. And it is worth mentioning that I really dug seeing Kyle disguise himself in mid-air. The look on his face was priceless. It was also interesting to note that even though Wally was the only one in costume Bruce, Clark, Diana and Kyle didn't look out of place. Plunkett and Nguyen captured them to near perfection. Kyle had an almost Indiana Jones look to him, though it would have been Dr. Jones with a power ring. Even still you knew who they were just by body language and action, which I thought was very impressive. Cover Art - 4: You know, I don't have a whole heck of a lot to say about this cover. It's a great image of the Flash running from a mushroom cloud with Faith in his arms, but it wasn't something that really had me going. On a technical level it was a very good cover. On the "Hey, you need to check this comic out," level it wasn't all that great. Is it possible to like something but not really care for it? These are the questions that fuel a thousand message board topics.